Come on, now. Stretch out those legs. Reach up, up, up those arms. 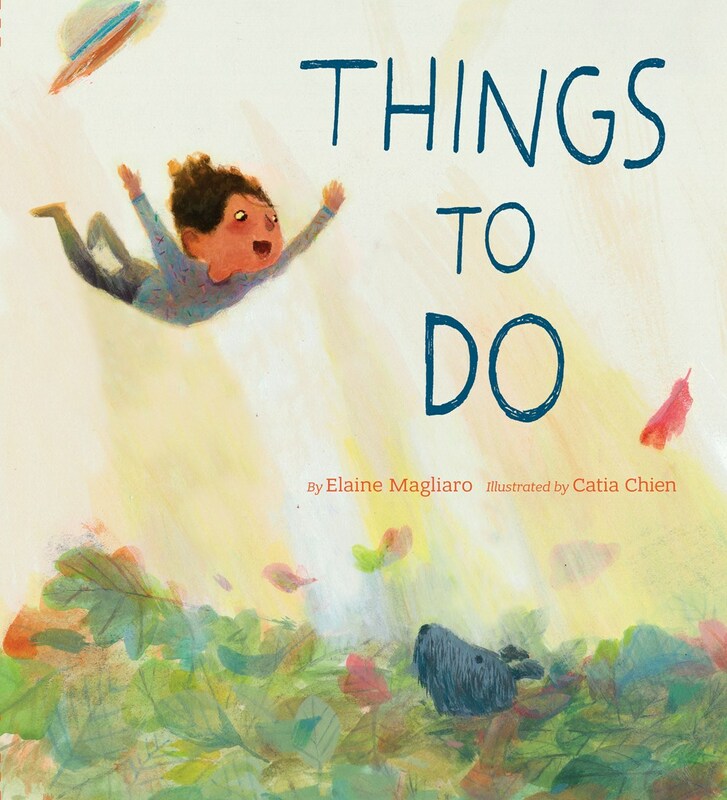 Let’s awaken our minds to the world as we turn our eyes on Elaine Magliaro and Catia Chien’s Things To Do. We open at dawn, and there are things to do. The child pulls back the curtains and sun comes streaming through the windows. Notice the words Elaine Magliaro uses to start each line in this poem. Words like wash, wake, set, and start. Just as she thoughtfully selects how to describe what’s going on outside those windows, Magliaro has chosen these words carefully. What do they say to you? Perhaps they are words you would use when talking about your morning routine. You wash up. Your body wakes. You set your mind to the day. You start today anew. 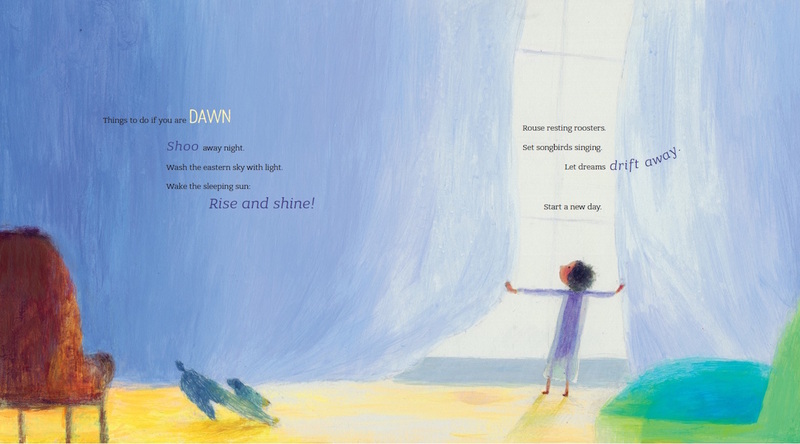 Think about what first word in a line from this opening poem speaks most to you and your morning routine. Are you like the child in Catia Chien’s illustration, basking in the light of the new day and welcoming it with open arms? Or do you identify with the dog in this illustration, stepping back from the window, giving in to just one more big stretch? Each poem in Things To Do plays differently with structure and rhyme. 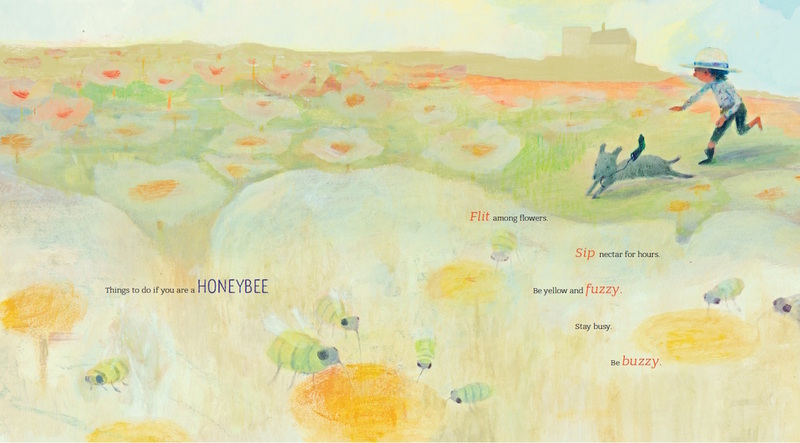 Notice the triple alliteration mimicking the sound of the bees in the poem above. The consonants flit from /b/ to /z/ to make a “buzz” and from /b/ to /ē/ to make “bee” and back again, creating the sound of a presence of a field of bees buzzing about. 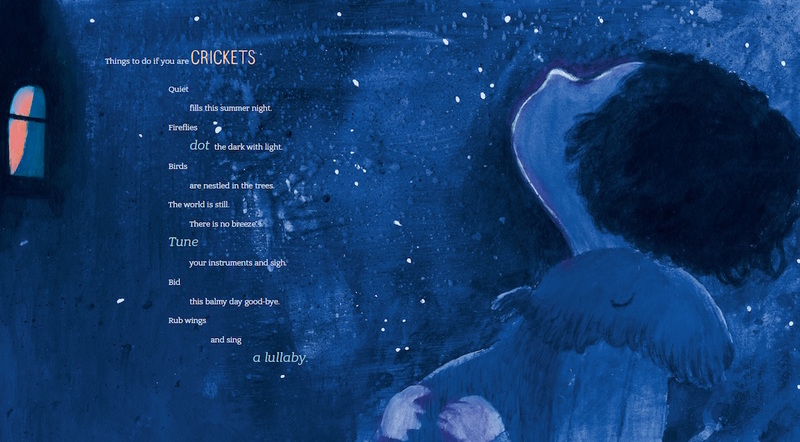 (To hear this amplified, have a small group of children read the last three lines aloud together.) Chien’s large painted flowers overwhelm the page and serve to wrap this golden scene around the readers. Can you hear the bees? Can you smell the flowers? I wonder what the child is thinking about right now. . . Perhaps her mind is on the shoe that her dog seems to have stolen from her. . . The wonders of your world are small. / Don’t hurry by. / Enjoy them all. 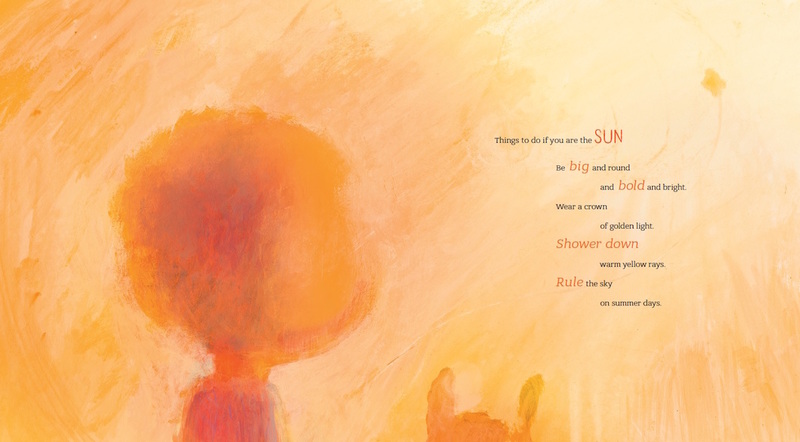 With a single page turn we experience our smallness against the vast presence of the sun. Consider what pairing the spread of the snail with that of the sun communicates to you? Does it make you feel differently about words like slowly, your world, and small when read in juxtaposition with words like big and bold and rule? 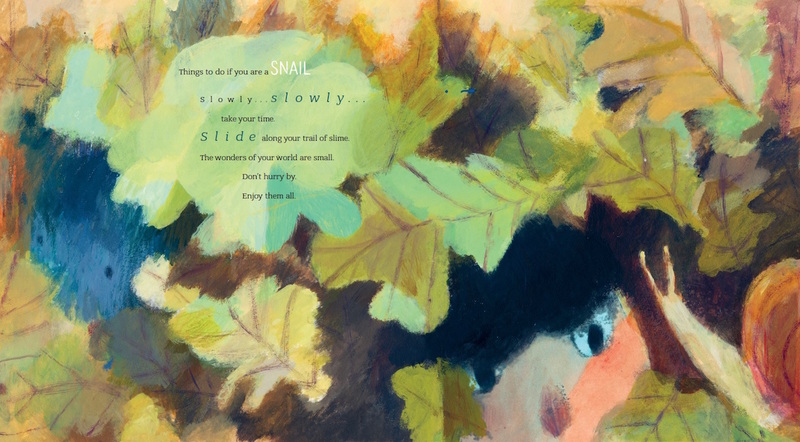 Where Chien brings in vibrant colors and a narrow viewpoint to the previous illustration, here she saturates the page in sunlight, leaving only silhouettes for our eyes to read along a poem that’s punctuated by single-syllable words, silhouettes themselves of all our eyes try to take in. These are the two images in Things To Do where the child in the story becomes every child. Where curious eyes become every child looking at their world. Where a barely distinguishable silhouette becomes every child, made equal under the sun. The story arc these poems share is of a child’s day and all of the vast and finite things one might notice throughout that day. We may each set out on the same day from the same place, and yet what we see and what we do will be infinitely different. We reach a universal conflict mid-story on the subject of making plans and hoping against hope that nothing stands in the way of those plans. And in this case, as witnessed in the poem above, the success of the entire activity rests on the cooperation of Mother Nature herself. 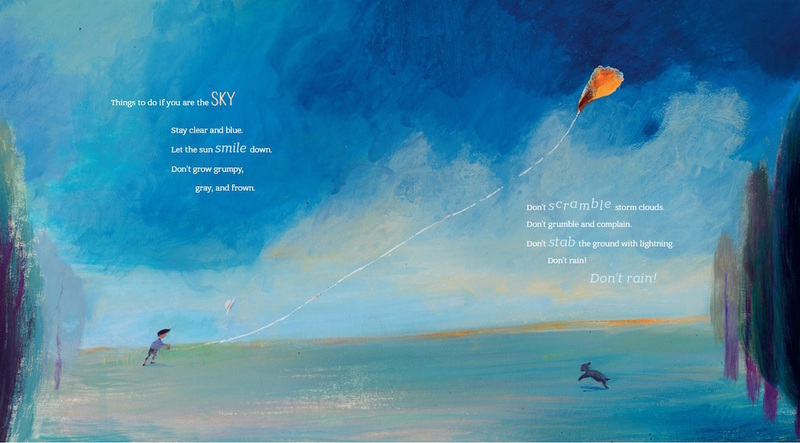 We see the child lose hold of confidence through Magliaro’s text, pleading to the sky to stay blue, to permit the sun to shine, and to not turn for the worse. The word don’t is repeated five times amid words that feel increasingly threatening until the day gives way to rain. The illustrations that follow give way to the changing weather as well, and are awash in deep blues and purples. The energy changes from outward, boisterous, and celebratory to inward, contemplative and observant. After some indoor activities (and some evening puddle-jumping) the rain finally subsides, and we’re left standing outside the house of the child in what I feel is one of the most evocative scenes for the senses. Let’s relive the scene, shall we? The rain has stopped. The sun has set. The air is filled with the smells that follow a storm. The night is quiet, but not. It’s nature quiet. The kind of quiet that reveals itself the more closely you listen. And this is where Magliaro and Chien leave us, standing outside as the fireflies light up the night. This poem slows the pace through rhyming couplets broken-lined to separate the subjects and what predicates them. The story will close with the moon, the greater watcher of the night. It will glow and light up the face of the reader, and maybe the poems in the story will do just that, too. Maybe they will light up something of wonder. Of curiosity. Of seeing those things set before us, and knowing that each of us on this planet, big or small, noticed or not, has something to do. Let’s close with a homework assignment, shall we? Go find wonder around you. Name it, and make it your own. Find a way of saying it and a way of feeling it. Share the wonder so it can grow.